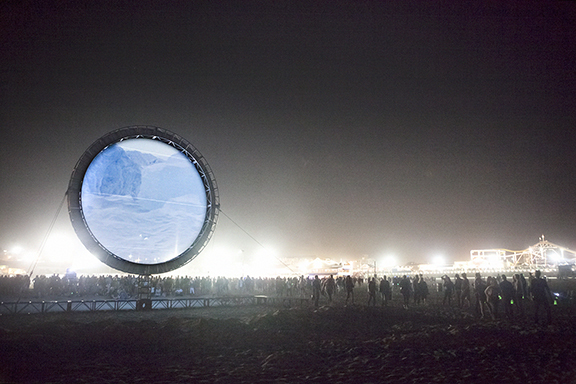 Circumsolar, Migration 1, 2013. Single channel video installation. 26:20 minutes. The video follows the migration of the arctic tern, a small sea bird that has the longest migration of all living beings on earth, flying from the Arctic to the Antarctic and back again each year. As such, it experiences two polar summers of 24-hour daylight each year, which makes it the one creature in the world that lives the most daylight. With the tern as its protagonist, CircumSolar, Migration 1 looks to explore larger themes critical to our time, such as the unstoppable force of migration; the ecological concern of climate change and other man-made detritus; the geopolitics of the changing landscapes of coastal lands and the Arctic and Antarctic regions; and at the limit of what is known, the role of the archetypal explorer, who goes beyond to bring back the boon to benefit all. Glow 2013. Group exhibition. September 27, 2013, a 24-hour event. Santa Monica Beach, Los Angeles, California. Curated by Marc Pally, David Familian, Meg Linton, Pilar Tompkins Rivas, and Stephen Nowlin. Work exhibited: CircumSolar, Migration 1, Single channel video installation. 25 × 30 ft. 226:20 minutes. Due North / í Nor∂ur. Group exhibition. January 9–25, 2014. Icebox Project Space, Crane Arts, Philadelphia, Pennsylvania. Curated by Marianne Bernstein. Work exhibited: CircumSolar, Migration 1, Four channel video installation. 100 ft x 30 ft. 26:20 minutes. Muziekgebouw / Rebeca Méndez. Solo exhibition. May 20–June 1, 2014. TrouwAmsterdam, Amsterdam, The Netherlands. Work exhibited: CircumSolar, Migration 1, Single channel video installation. Sound by Ben Frost. 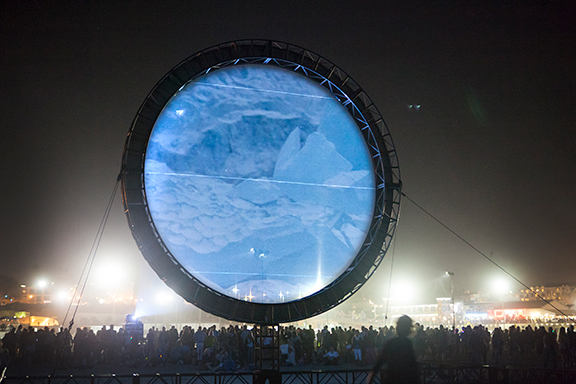 15ft circular screen. 26:20 minutes. CircumSolar, Migration 1, 2013. Single-channel video installation. 26:20 minutes. Dimensions: variable, architectural scale. Glow 2013. Group exhibition. September 28, 2013. Santa Monica Beach, Los Angeles, California. Curated by Marc Pally, David Familian, Meg Linton, Pilar Tompkins Rivas, and Stephen Nowlin. Work exhibited: CircumSolar, Migration 1, Single-channel video installation. Color, silent. 25 × 30 ft. 26:20 minutes. Due North / í Nor∂ur. Group exhibition. January 9–25, 2014. Icebox Project Space, Crane Arts, Philadelphia, Pennsylvania. Curated by Marianne Bernstein. Work exhibited: CircumSolar, Migration 1, Four-channel video installation. Color, silent.100 ft x 30 ft. 26:20 minutes. Muziekgebouw at Trouw. Solo exhibition. May 20–June 8, 2014. TrouwAmsterdam, Amsterdam, The Netherlands. Curated by Kim Tuin. Work exhibited: CircumSolar, Migration 1, Single-channel video installation. Color, sound by Ben Frost. 15ft. circular screen. 26:20 minutes. CircumSolar, Migration 1, 2013. Single-channel video installation. 26:20 minutes. Installation view: Glow, Santa Monica.